OK, so this has just about ZERO to do with gardening, but we're in the middle of some of the coldest weather on record here in Virginia, and today I'm not really thinking about gardening. I'm thinking more about cozy fireplaces, toasty ovens, and warm bread ... lots and lots of warm bread. So, today I made Yorkshire Pudding! 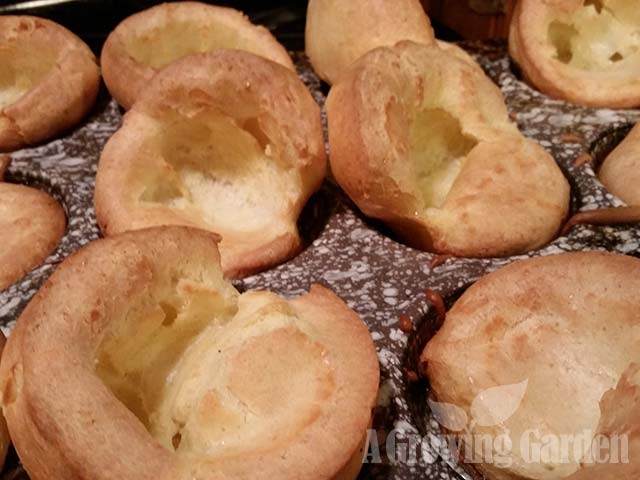 Have you ever had Yorkshire Pudding? From it's name, you wouldn't really think it was a bread, would you? ... but it is! 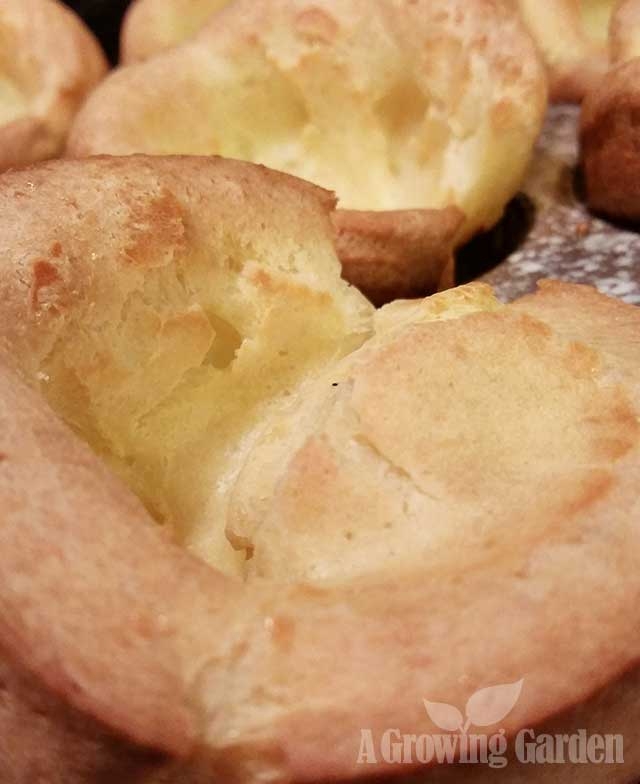 Unlike any 'pudding' we in the US usually think of, Yorkshire Pudding is sort of a mix between an pop-over and a souffle. In Great Britain, it is traditionally served as a side along with a roast, however, it can also be served as a dessert. I've found that I really like to eat them with a poached egg on top (especially since they form a natural bread bowl!). These are just about the easiest things in the world to make. You don't need any fancy equipment or pans -- I just use a regular old 12 tin muffin pan to bake them in, but you can also use ramekins, small cast iron skillets, or baking dishes. Pretty much anything that can go in the oven and is relatively shallow will work. There are only 4 simple ingredients: eggs, milk, flour, and salt. You'll also need some kind of fat to bake them in ... traditional recipes call for using meat drippings, but you can use lard or vegetable oil instead. There isn't any fat in the batter, but you bake them in hot oil and that makes the batter rise and get super fluffy and yummy. The trick is that you need to heat up the muffin pan with the oil already in each of the tins, then pour the batter into the hot oil and put it in the oven to bake for about 25 minutes. It's important that, like when baking a souffle, you don't open the oven while the puddings are baking ... just leave everything alone until your timer goes off. 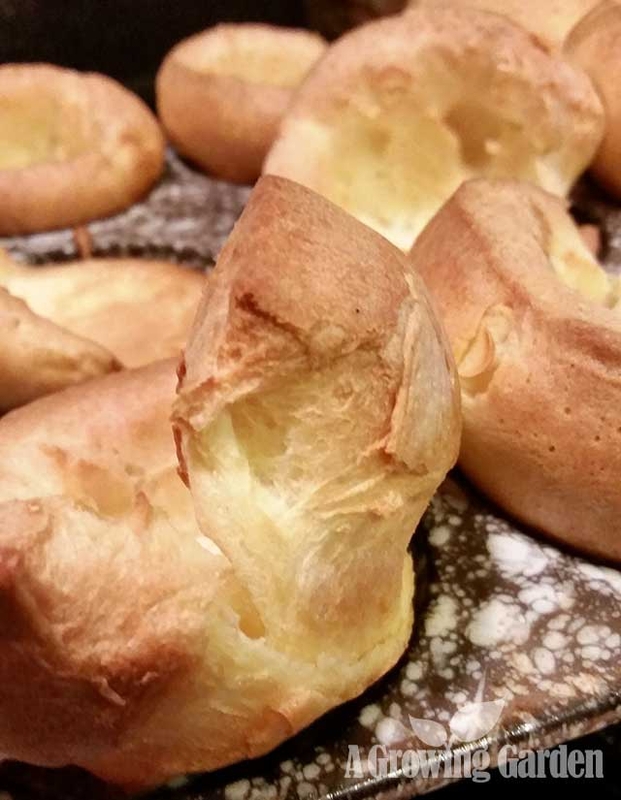 And, voila!, you'll have perfectly puffed Yorkshire Puddings! Place about 1 or 1 1/2 tsp of oil into each muffin tin and place the tin into the oven. Turn on the oven and set it to 400 F.
Crack the eggs into a large mixing bowl and whisk them together. Add the milk to the eggs and mix well. Sift the flour and salt together and add to the egg/milk mixture. Whisk everything together until there are no lumps and the batter just coats the back of a spoon. Transfer the batter to a extra large measuring cup or a bowl with a spout (or something that will allow you to pour the batter easily). After your oven is nice and hot, pull the muffin tin from the oven (you'll want the pan really hot -- I usually leave it in the hot oven for a good 15 or 20 minutes or so before filling with batter). Fill each muffin tin with batter. I don't usually measure, but rather just pour a bit into each tin until all are filled about the same. The batter will fill standard muffin tins about 1/2 to 2/3rds. Bake for 20-25 minutes. As tempting as it might be, don't you dare open the oven during baking time! You don't want your little puddings to deflate!! After 25 minutes of so, the puddings should be tall, fluffy and a golden brown. They are best served right away, but I've found that they keep pretty well and you can also freeze them. Kale Chips Anyone? ... Anyone? ... Beuller?